Mouthpiece For Terrorism Al-Jazeera, Gets Sanctioned by Israel……. – The Tundra Tabloids……. The reason: Al-Jazeera’s bureau chief in Beirut, Ghassan bin Jeddo threw convicted -and just released- murderer Samir Kuntar a party in his honor. J’lem Post: The party, held in Beirut, was organized by the Al-Jazeera bureau there to honor Kuntar on the occasion of his release from Israeli prison. He was hailed as a hero who carried out a brave military operation against the Jewish state. The Government Press Office said it would impose sanctions on Al-Jazeera and demand an explanation from the station. 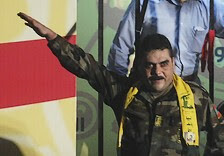 […] Kuntar, for his part, thanked Jeddo and Al-Jazeera for supporting him and other prisoners in Israeli jails and for waging a campaign to bring about their release. Daniel Seaman, director of the GPO, expressed outrage over the event. On Tuesday, Seaman phoned Walid Omari, the Al-Jazeera bureau chief in Israel, and summoned him to an urgent meeting to inform him of the GPO’s decision to suspend ties with the station. Omari, who is currently abroad, is scheduled to report to the GPO on his return, a source at Al-Jazeera said, adding that the station had still not been informed of the new measures against it. About a year or so ago, Finnish state TV YLE’s “Aamu-tv” (morning program) had interviewed a representative of Al-Jazeera. It was the puff piece that was to be expected, because there is no stomach within that organization to ask the tough questions, especially from those they sympathize with. What we got instead was a bunch of snide remarks or comments about how biased Fox News is. You know, the rolling of the eyes etc. Previous Post Previous Post End The Saudi-OPEC Monopoly, Fight Nozzle Rage……. Next Post Next Post Obama The Peace Maker…….